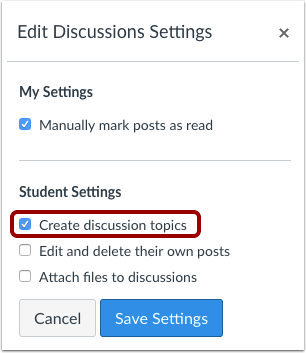 You can allow students to create a new discussion by changing the settings from the Discussions page. 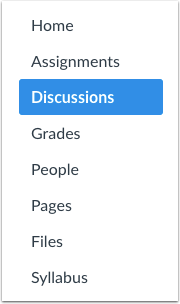 When this setting is enabled, discussions created by students become part of the course and are included in future course copies and exports unless the discussions are deleted. The course discussion student setting can also be changed from the Course Settings page. Note: If a student creates a discussion that includes a file, the file will be added to the unfiled folder in course files. Check the Create discussion topics checkbox. Previous Topic:How do I link to a YouTube video in a discussion reply as an instructor? Next Topic:How do I allow students to like replies in a discussion? Table of Contents > Discussions > How do I allow students to create a course discussion? Re: How can students post an individual discussion? Re: Transform accidentally created discussions into replies?